A police versus mafia action thriller, The Stone Killer mashes a Dirty Harry derivative attitude with discarded extras from The Godfather and comes up with a messy little film. New York police detective Lou Torrey (Charles Bronson) uses violent methods to stop criminals. His superiors finally get tired of the bloodshed, and terminate his employment. He accepts a new position in Los Angeles. Some mafia-related bodies start to pile up, while some ex-military types start to create some mayhem. Torrey's investigation takes him back to New York as he suspects that a major inter-family mobster confrontation is about to erupt, but his superiors are unimpressed. Mafioso Al Vescari (Martin Balsam) is indeed planning a major cull of his rivals, in revenge for mass killings that took place all the way back in 1931. Vescari is planning to use Vietnam veterans to carry out the assassinations, and sets up a desert camp to train and equip the hit teams. After shaking down various low-lifes, Torrey finally locks in on the plot and sets out to disrupt it, but Vescari will not be easily discouraged. One of six collaborations between Bronson and director Michael Winner, The Stone Killer carries all the typical fingerprints of a Dino De Laurentiis "presentation": ideas ripped off from other recently successful sources, lower-level talent, and cheap production values. 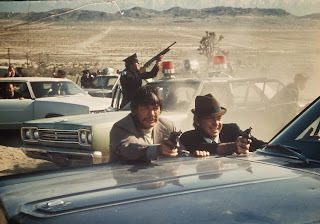 The attempts to mimic Dirty Harry are just too obvious, and the under-developed mafia angle is reduced to old mobsters walking through a cemetery commiserating about long-lost colleagues, and other old mobsters being mowed down in a hail of bullets. The details of the John Gardner script, based on a Gerald Wilson book, are pretty much incomprehensible. Most of the movie has Torrey reacting to, chasing down, or shaking up minor criminal characters intent on killing each other. Somehow from the growing clump of dead bodies Torrey concludes that an army of veterans is being trained in the desert and that many mafiosi are about to die. None of it really makes sense or actually matters. The Stone Killer methodically builds up to a couple of everyone shooting at everyone climaxes, the first in the desert training compound and the second in a parkade, with police cars always piling into the action sirens wailing. Here, with no need for acting or plot, at last Winner builds up a head of steam and delivers some good mindless action. 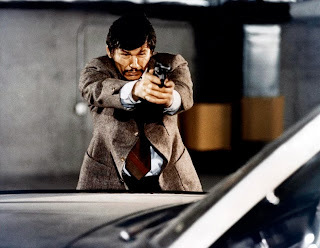 Bronson moves smoothly through these scenes of carnage, with his relatively small gun somewhat incongruous amidst all the machine gunnery, but he never misses with any of his shots, so at least he has that advantage. Martin Balsam's role is small and cryptic, while the rest of the cast is filled with television-level luminaries such as Norman Fell, John Ritter and Paul Koslo. Filmed with little style and even less wit, The Stone Killer fires mostly blanks.